Textured, contoured handle provides a good gripping surface . Clamp holds firmly to tub wall without marring tub surface . Lightweight, compact design is excellent for travel . Color: White . Fits tubs with walls 2.5"- 6.25" thick . Not recommended for use with fiber glass tubs . Tool-free installation . Available in two sizes: standard (12" height) and tall (16 ½" height) . 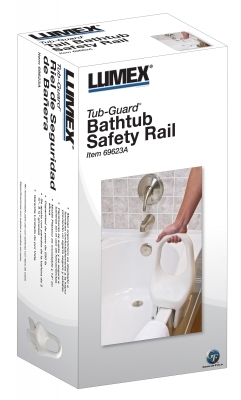 Tall model provides two gripping surfaces to facilitate both entry and exit from tub . Attractive retail packaging . Maximum Weight Capacity 250 lb - EVENLY DISTRIBUTED . Lifetime limited warranty .